v. MECCA Maxima Garden City store. 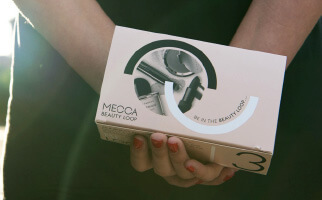 Shop 2319, Westfield Garden City, Kessels Rd, Upper Mt Gravatt, QLD 4122.
d. comply with the Mecca Beauty Loop Terms and Conditions which can be accessed at https://www.mecca.com.au/beauty-loop-terms-and-conditions.html. iv. Mecca Cosmetica Fresh faced hydrating primer 45ml valued ad AUD$40 (including GST). The value of the Gift Package is based on the recommended retail prices as at 8th June 2017. MECCA accepts no responsibility for a change in Gift Package value between now and the ultimate Gift Package redemption date. If, for any reason, any of the specified items (or any part of them) in the Gift Package are unavailable or out of stock, MECCA reserves the right to replace them with something of similar value and/or specification. The Gift Package must be redeemed in-store during the Promotion Period at the time of participation. If a participant does not redeem the Gift Package during the Promotion Period, then the participant’s entitlement to the Gift Package will be forfeited. Gift Packages, or any unused portion of a Gift Package, or any part thereof, are not transferable, saleable or exchangeable and cannot be taken or redeemed as cash or equivalent. It is a condition of accepting the Gift Package that the participants must comply with all conditions of use of the items comprising the Gift Package and the Gift Package supplier’s or manufacturer’s requirements. To the fullest extent permitted by law, MECCA makes no warranties, representations or guarantees, express or implied, in fact or in law, as regards this Promotion or the merchantability, quality or fitness for a particular purpose of any of the items or any component of any item included in the Gift Package. Any cost associated with participating in this Promotion, or using a UnionPay card, is the participant’s sole responsibility. 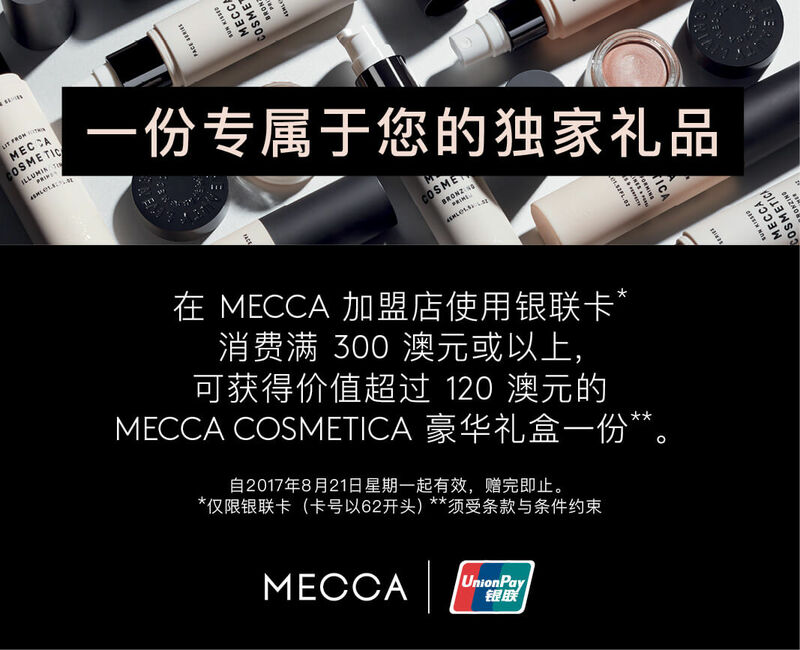 Interactions with UnionPay and the use of a UnionPay card is at the participant’s own risk and participants recognise that those UnionPay products/services are not provided by MECCA, but by UnionPay. Participants should carefully review the UnionPay card terms and conditions. No endorsement or affiliation of UnionPay shall be construed in any manner whatsoever, notwithstanding anything else contained herein or otherwise. (d) use of the Gift Package or any items forming part of the Gift Package by the participant. MECCA assumes no responsibility for any error, omission, interruption, deletion, defect, delay in operation or transmission, communications line failure, theft or destruction or unauthorised access to, or alteration of, Gift Packages or any other event beyond its control and, in these circumstances, MECCA may, at its absolute discretion, cancel the Promotion (without liability). Without limiting any other terms herein, the participant indemnifies MECCA for any breach of the above terms, conditions or warranties. MECCA collects personal information in order to conduct the Promotion and may, for this purpose, disclose such information to third parties, including, but not limited to suppliers of the Gift Package. A request to access, update or correct any information should be directed to MECCA. This Promotion and any issues relating to the construction, validity, interpretation and enforceability of these Terms and Conditions shall be governed by the laws of Victoria, Australia. If you have any questions regarding these Terms and Conditions, please contact MECCA by email at customerservice@mecca.com.au or by telephone on +61 3 9420 7373. We bring the best in global beauty straight to you. 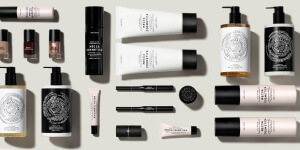 Discover over 100 brands including Origins, La Mer and YSL, plus exclusive brands to MECCA such as NARS, Chantecaille, Eve Lom and Sunday Riley. Created by founder Jo Horgan, MECCA grew from one store on Toorak Road, Melbourne to become Australia and New Zealand’s most loved beauty destination. Giving you the convenience to shop the way you want. And we’re growing! We’re available at all your favourite shopping destinations — think Chadstone, Pacific Fair, MYER, Melbourne and Sydney CBD. Plus, we’re at your fingertips online with free shipping over $75. A high-performance collection, Australian-made and owned. For the sun conscious, our SPF skin care and makeup are a must. Book a makeup lesson and learn expert tips and tricks from our MECCA Makeup Artists. Sit one-on-one with our experts to have your makeup professionally applied, with the cost fully redeemable on products purchased on the day. MECCA Beauty Loop is our loyalty program that makes every purchase rewarding. The benefits include beautifully curated product sample boxes, birthday gifts, complimentary makeup applications, exclusive events and more. 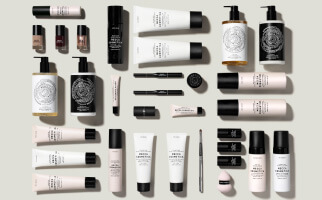 We know you want the best value for your favourite beauty products, which is why we’re committed to bringing you our exclusive brands at a price that is as close to the international market as possible.